Just add my nickname to your credits list. If you want, you can also link to my OGA profile. Sweet! Nice work. I like the other kit too. BTW, the legs are separated so that the torso can be turned during movements, but I'm not sure if everything will work correctly in a game (maybe I should add hips above the legs). Would be cool to get some feedback. This is great work Skorpio! Even better than your previous kit and your previous kit is awesome! This deserves a game to be made out of it, cmon people get to it :D . Also skorpio, what are your plans for that 3d modular models? No definite plans for the 3D mechs yet. I've only sketched some sci-fi/mech weapons, which I still want to improve before I turn them into 3D models. I'll have to check out how to make the mechs modular first. Are you still working on your mechs and will they be modular, too? Nice! 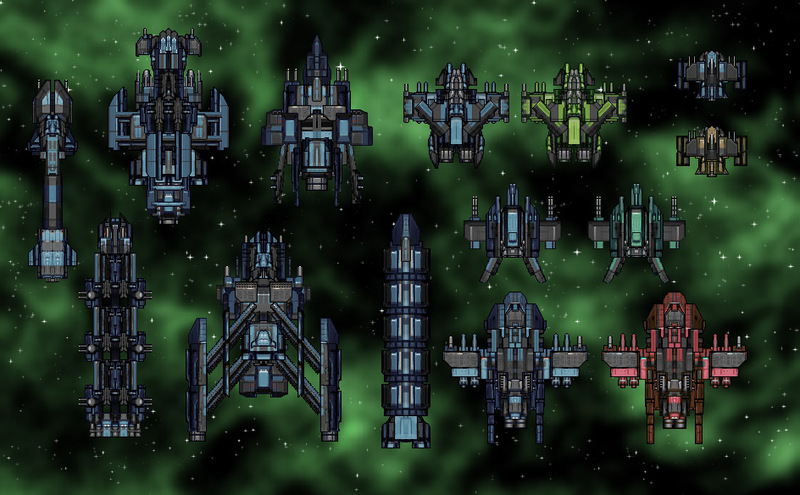 I am actually working on a 2D Sci-Fi game, if that project turns out to be worthy of your great sprites I will use them for sure. Thanks for sharing! You are really skilled Skorpio, wonderful work! You can use everything on Opengameart in commercial projects. Now I really wonder what a shipmunk is. However, maybe i misunderstood the licences! If i can make up something nice with your work, i will surely let you know! I would like to host your parts as individual files that I could access with just a url, like arrall.com/p/body1.png, and then modify my app to use urls rather than hard coded images. If all goes according to plan, each part/url would be available by searching a database that could list image url, author, author homepage url, license, etc. This version of the app would optionally have a username/password so that projects could be saved to an account. I'm hoping to have rating, tagging, best, and recent project systems. And allow users to open/copy any project and make/save their own version. As an author of parts I'm already using, does this sound acceptable? 1) Moderating the images, tags, etc to filter out profanity and other nasties, seems like it would be annoying. 2) I hope to allow anyone to add urls to the database, and rate/tag individual parts. For the parts (mostly yours) that I would start with, and host myself, it seems nothing would prevent people from linking to the part urls or downloading them outside of the app and the author info. Would use of the parts like that be my fault or the people leeching the hosted files? 3) Has an app like this been done, and done well, already? I wish we could just embed author info in each image file! Sorry for the late reply, I didn't see your post. Sure you can host the images elsewhere, only the license information needs to be clear. I can't help with the points 1 and 3. As for point 2, I think that would be the fault of the users. Nobody should use images without recognizing the license. Anyone know if there is an easy way to adjust the hue/saturation of all the layers at once in GIMP 2.8? I like the parts, but I'd like them to be colored closer to the red parts from the first ship construction set. 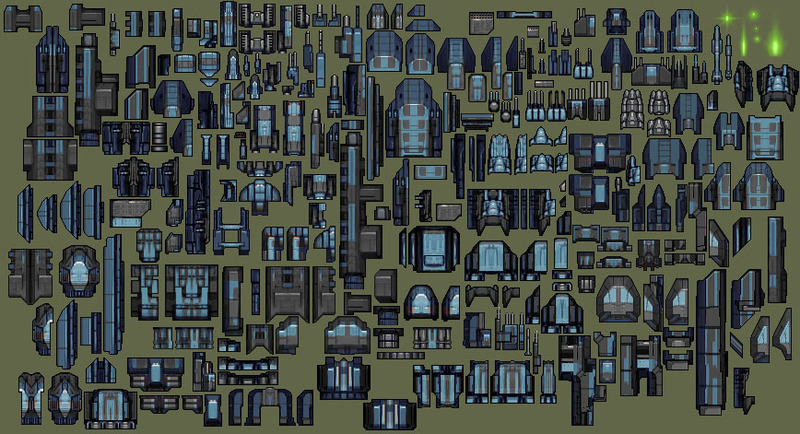 Also, if there is some way to Export all the layers as individual .png files that would be pretty helpful too! I'm using the ship parts in http://www.stellarscaping.com which I'm just now piecing back together. Hello. 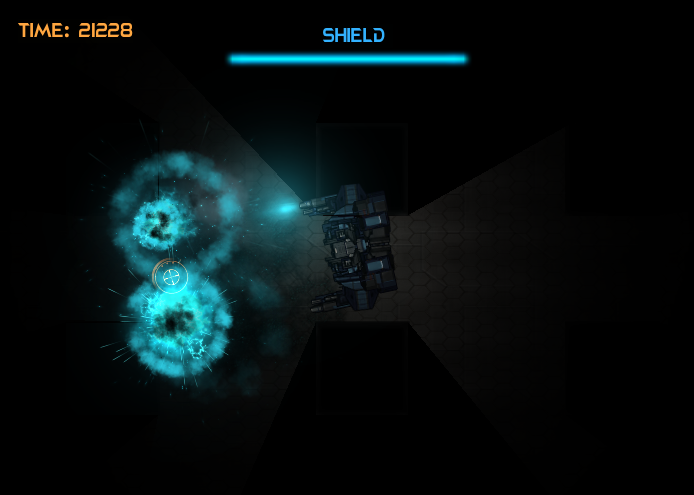 I used one of the pre-made mechs for a school project that you can play here. I would have made my own but time is something I still don't have much of. Thanks! Hey, great demo game. :) Are you going to expand it eventually? Hello skorpio. If I do more with this, I am going to re program the whole thing as we were only to use OpenGL 1.1 (no shaders) but right now finals are coming up and I have other stuff. I did make it so the top of the mech pointed towards the mouse and the bottem in the direction of travel, but the animation looked wrong and I needed to do a little extra math work inorder to make it look right. I just added this second kit to part2art.com and made some quick examples for OGA. Fixed some large, but simple bugs. It is unstable at times, but mostly working. These two kits you've made are all I plan to include for every user as defaults. I list Skoprio and the licsense on the main menu. These are all awesome parts. As strange as it might sound: You ´ve just made someone very happy :) This is EXACTLY what i was looking for for i am making a little space rpg and need a lot of different ships. I was looking for a modular system - just like yours. You´re name is in the credits already. Thx! Thought I would give you a shout out Skorpio. Thanks for the parts. I've been putting stuff together for my space rpg game to, and the construction kit with wuditogs app have been invaluable to the effort. Plz let me know if I missed something regaurding proper crediting of the soucre. And keep of the good work. Is there any way we could get the sets done in differing colors? Hi Skorpio, not sure if you still read this comment section but I love this set and I was wondering if I could use it in a game? I know that it says to just put your name in the credits but I wanted to make sure. I don't really have much of a plan for the game beyond "fly around, gather ships, fight other ships" but I'm going to work on that! Currently I've built one ship, a small fighter. What do you guys think of it? Nice little ship, it looks kinda cute. :) Personally, I'd maybe add some pseudo wings with additional weapons and a sharper prow, but just do what you like best. 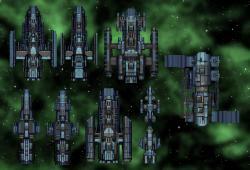 Btw, you guys should really try to change the hue of your ships, they don't have to be blue. Double post. The website has become a bit laggy, hasn't it? 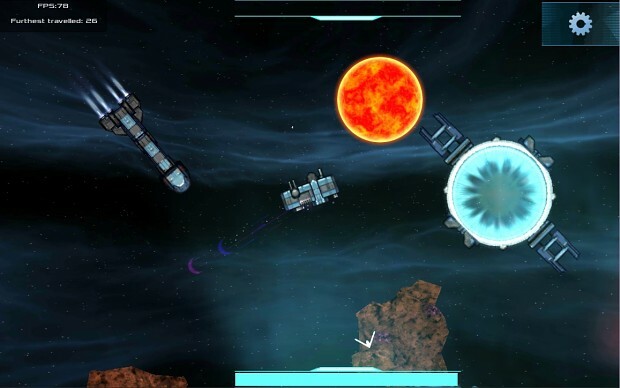 Try Shoot_Em_Up_kit by Tall Studios. Very inexpensive To test with. Your artwork is amazing. 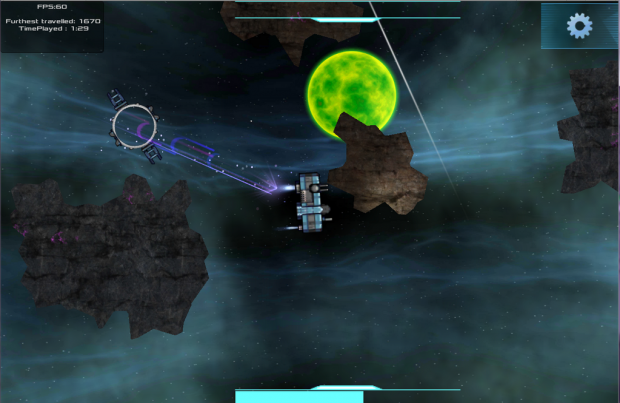 It would be perfect for a space shooter I am making. I have read a little bit about licensing and I find it a bit confusing. Am I able to use your art in a commercial project as long as I credit you and put a link to your website? I just want to follow your requirements correctly. Any help would be greatly appreciated. Again, thank you for creating such awesome art. Great work with this and your previous parts sets. I plan on using both throuout a project I'm working on, (unlike some of the things I'm using as placeholders now.) I admit, I'm a newer programmer cutting my teeth on this project. and doing it in small stages. You can keep an eye on it if you like as my prject using the Godot Engine is on github at https://github.com/DCowboy/Star-Game I'm currently working in the version2 folder as the first was working out a boundries and world-wrap system. I haven't built a credits page yet, But there will be one after I weed out the placeholders. That said. in later stages of the project I would like to add in side-scroller type maps as well, While my picture below shows I was able to cobble together a top and side view of a small ship the parts feel kind of limited, (which makes sense since it doesn't seem designed for that in the first place.) 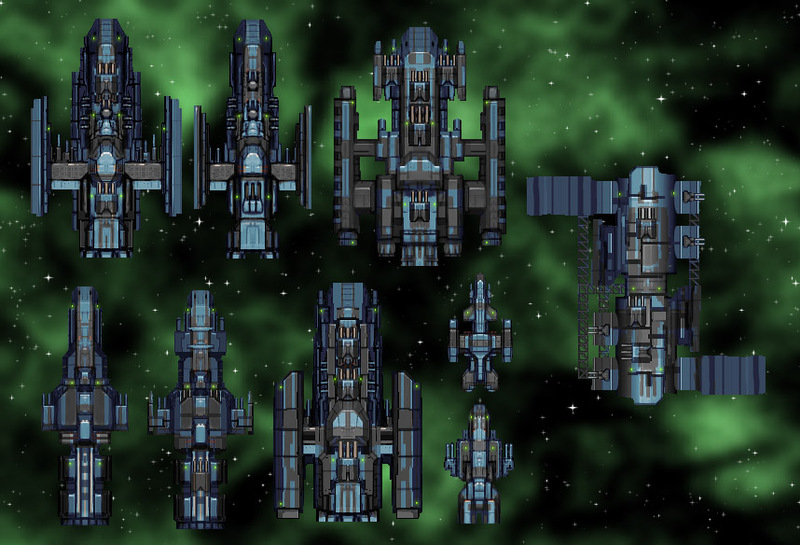 I was wondering if you might be interested in creating exansions for both sets adding some side-view friendly versions that could represent some of the wings and cockpits? If you decided to, I wouldn't need them right away, I don't plan to add those elements in for another stage or two yet. Below, if the upload works, is an example of what I'm trying to accomplish with my request. I haven't changed the hue yet. Hi, Skorpio! And thanks a lot for these two construction sets!!! You're credited on the webpage currently, and when I add credits you'll be in there. I just wanted to say thanks for the assets!